TREND: The day after e-mailing a press release the "Artists Survivor Series" first offering that will help guide visual artists how to write press releases and market events, Fumiko Amano sends an e-mail about her immediate self-release as co-director of Pharmaka Art–– resigning her post effective January 30 to focus on her personal art work. Some visual artists have mastered basic marketing skills needed to promote a show or an event. For others it's a daunting task. Here's some help from Pharmaka Art and Atelier Zero. We roam Edendale, the Arts Walk and meet a photographer in the January 19 edition of Garment & Citizen. Dot Dot Dash: A handful of truth with a Downtown spin, and never above gossip. MapMashUp: If Cartifact had a contract to document those pesky spills, the news may have leaked earlier. The real "Homeless Heat Map" can be found here or via blogdowntown. "People channel their energy in different ways, and I think that street art is not all positive, but there definitely have been positive things that come out of it," Fairey says. "A lot of it comes down to people want something to show for their existence. Sidebar: Alook at graffiti artists gone legit including Gallery Row's Man One (Crewest). 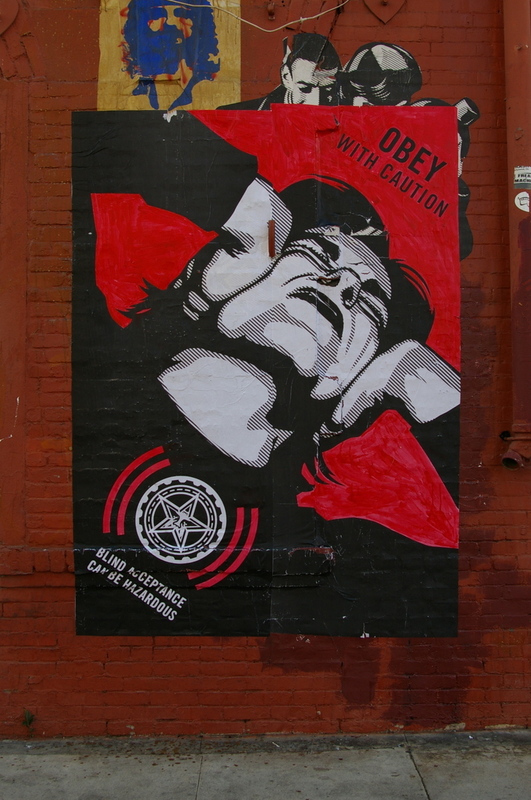 Photo: Shepard Fairey hits the Arts District (again). Before it gets too far away, congratulations to Celia (5th and Spring) and Jim (trained monkey). Two downtowners who blog, met each other, and are now married. The wedding was at Union Station and the happy couple are about to leave for their honeymoon. Add: Sha in LA posts about the wedding. The vendors allege that police and city officials have moved beyond citing vendors without business licenses to arresting cart owners and impounding their equipment. They speculate that the tougher enforcement is largely due to complaints from nearby fast-food restaurants and the influx of downtown residents. "They've been really heavy-handed in their enforcement," said Angelica Salas, executive director of the Coalition for Humane Immigrant Rights of Los Angeles, which is urging curtailed enforcement and a change in city law. Salas questioned why the city is punishing vendors who pay license fees and taxes and pass health inspections. "If you don't want sidewalk vendors, why are you giving them permits?" she asked. That's where I will protest. It's a code issue, not a civil or human rights issue. How many the small restaurants in the area are immigrant owned? They may be some of the speculated "fast-food" vendors who sent in alleged complaints. 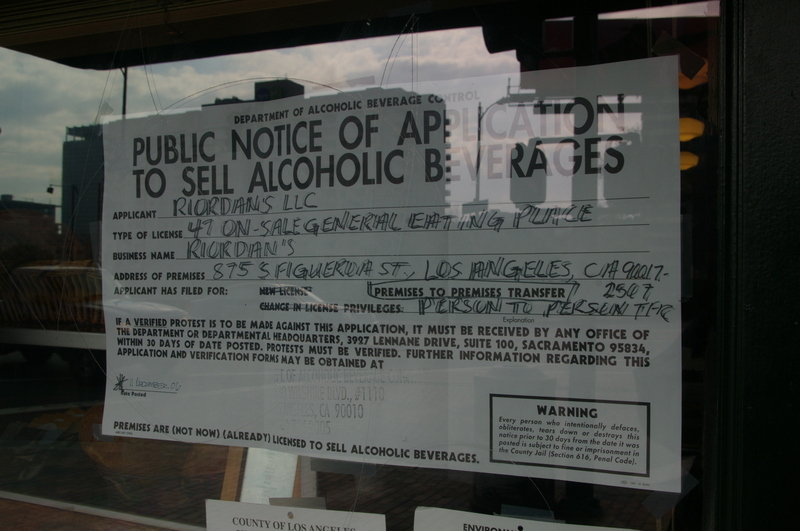 Maybe the answer is no more permits until a vendor takes a workshop on current codes. And a new code that allows an "all day pass" on a spot designated for a cart. Frou-frou menu posts –– to go. Seems there's run of comfort food postings. Maybe it's the weather. Let's jump in via WiFi from an undisclosed location, no where near snow. CHANGES The Pantry breakfast and lunch annex will soon be a steakhouse if you believe the sign in the window. Expect the weekend breakfast lines to be longer when filled with locals, USC fans and trade show goers from the nearby convention center. We predict lines 2 hours long. The wait became shorter with the extended Pantry having tables that could up seat 8 in a party. As a waiter said last weekend, "It gonna be packed, but the other side handled the crowd for 60 years, so we will see." FUSION REVISITED: The Chop Suey Cafe and Lounge opened with a dragon bang last summer and since had mixed––some snarky–– reviews of it's Asian Fusion and traditional Chinese dishes. The two highly trained opening chefs have moved on. A new chef is in the kitchen and started just last week. WE PLEDGE TO 'LAY OFF DUPARS': LAO reports that Du-Pars at Third and Fairfax finally re-opens after two years. Now THEY have chef's from "highly trained restaurants" -- which is overkill when all you want are pancakes. PREVIOUSLY AT THE FAR EAST CAFE: One long time Little Tokyo resident 1952 childhood memory of the Far East Cafe doesn't include the upstairs room used for wedding rehearsal dinners. It's remembered as the place where the waiter took your order while leaning against the wood panels, cigarette with a long ash waited to drop. How noir. LAST CALL FOR CHICANOCHINOS: LATimes has an obit for a passing muse, Tia Chuca's in Sylmar, that gave gatherers culture with their lattes. MEMORY FROM LAST WEEK Blogdowntown posts memories about Angelique Cafe–-fearing the worse with it's change in ownership. Yes, the menu may be the same, but something could get lost in the translation. It takes someone from France to give the right attitude for a French Cafe. WAKE UP Nicks Cafe stays true to it's form. Breakfast, one cut back to early hours to focus on wraps for the new loft condo crowd, will again be served through lunch. The small roadside cafe on 1300 Spring Street, across from "the cornfields", lived from the crowd from local arts nest, the Brewery. Owner (and a former LAPD Detective) says the artists don't get up early enough to have breakfast before 10:30. We presume AM. 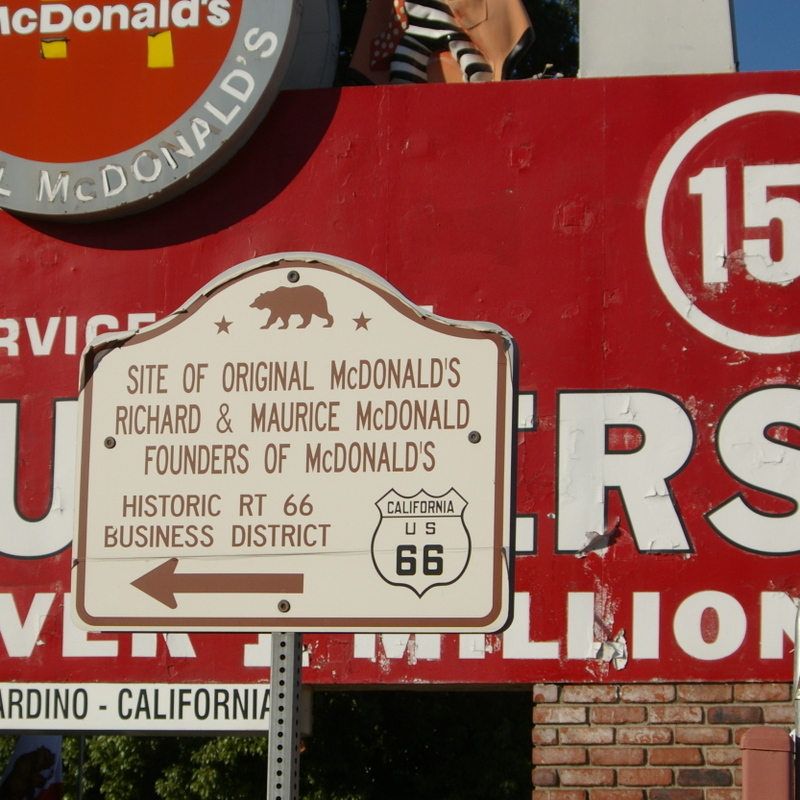 MEANWHILE, OUT OF TOWN: We posted earlier from the original McDonalds on Route 66 in San Bernardino that's now the main office for chicken magnet, Albert Okura. 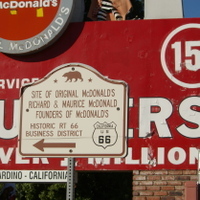 The corporate headquarters is also a roadside museum showing Mc Donalds lore that you would find....well...along Route 66. According to the LA Times, Okura has expanded his 66 portfolio by purchasing the town of Amboy, complete with cafe. The board of LARABA is presenting "Uncommon Ground", a publication holding the results of an urban planning workshop held at SCI-ARC on July 16,2006. It's being held from 5 to 7pm at Jason Ha's e3rd Steakhouse near Traction and 3rd in the Arts District. 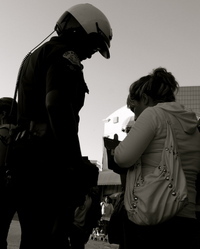 In a flurry of emails, the Los Angeles Downtown Arts District newsgroup is welcoming back LAPD Arts District Senior Lead Officer Kris Werner with reports of increased tagging, encampments, and the reappearance of 'violent guy', a homeless person with a pattern of being arrested and released. A factioid sent along was that 911 can be used to report tagging, although I assume it's if you see it about to happen or happening. That's a question for the upcoming community meeting at Art Share this Thursday at 7:30 pm. Pictured: Recurring small encampment on Traction.